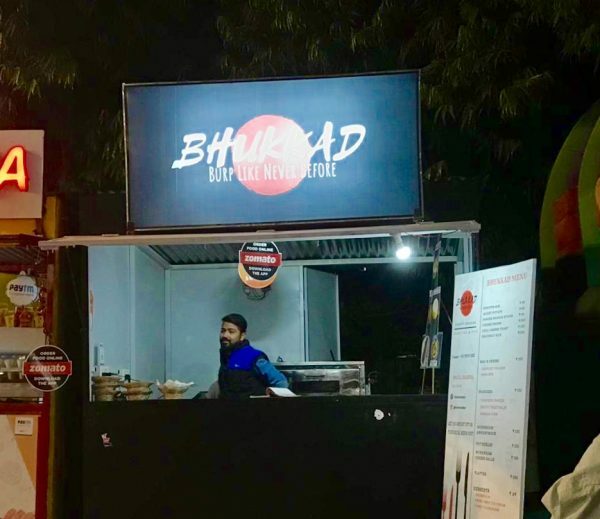 Khaugali needs no introduction in Udaipur. 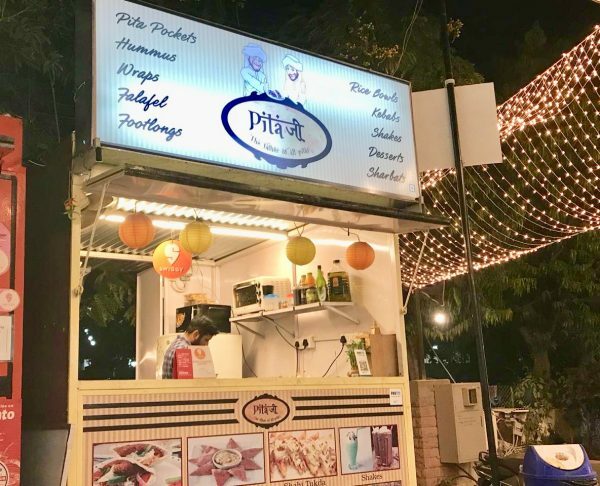 It has become the new ‘Meet-up’ junction for friends, bucket list place for the foodies, and a selfie spot for the studs and divas of the town. 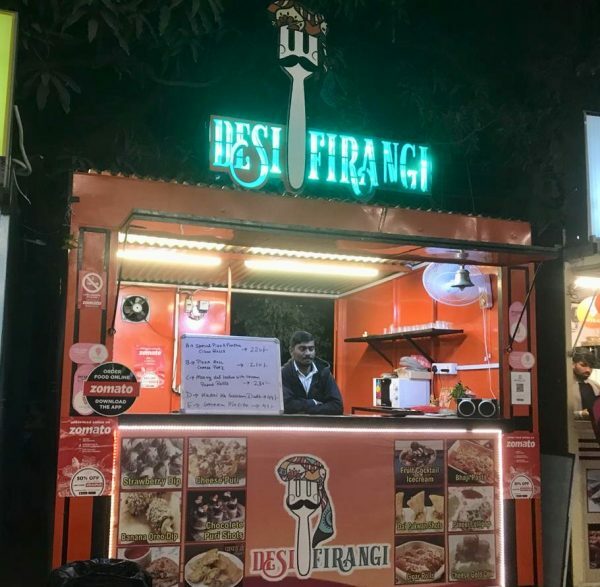 But while you are there, one thing that remains the biggest confusion is what all should you try and from where given that there are an umpteen number of food joints all around. Well, worry not, we have brought the absolutely new foodie bucket list for you all at Khaugali. Below are the things that may stun you or drool you. Whatever it may, make sure you DO NOT miss these 5 dishes while you are at Khaugali. Want to have Maggi? But love pizza as well? What if I tell you that you can have both at the same time? You heard it right! 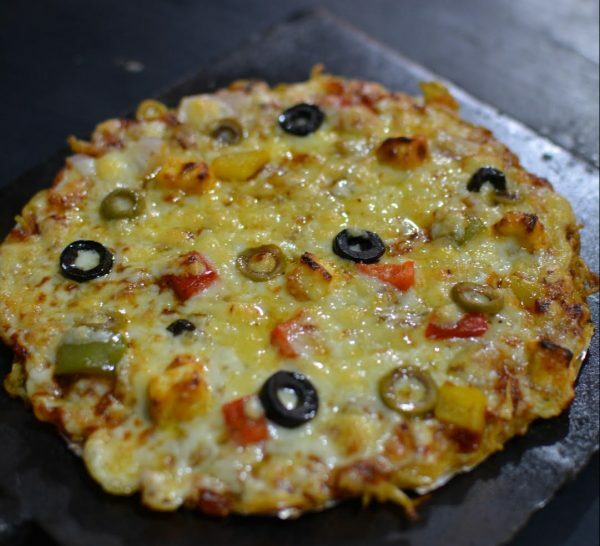 Magizza is one lip-smacking combination of your favorite masala Maggi turned into a pizza with lots of cheese and veggies topped onto it. This two in one dish will surely give you the ultimate foodgasm of your life. Also try – A steaming cup of hot Chocolate with it will bring an end to your dream meal, I’m telling you! Falafel pita sandwich will wake your unstoppable love for Lebanese cuisine. 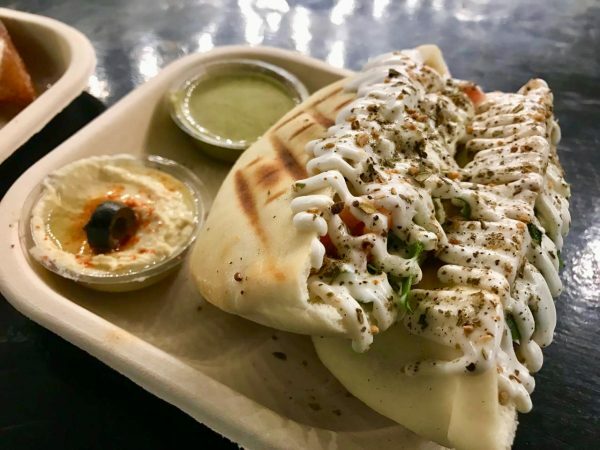 Moreover, it’s the first street Lebanese joint which serves a bunch of finger-licking Lebanese dishes, one of which is the Falafel pita sandwich. Hummus, falafel Tikki, veggies and loads of liquid cheese filled in scrummy pita pockets will be an absolute bliss to your taste buds. They are served with Lebanese dip hummus and our very own green chutney. Also try – to complete your blissful Lebanese treat, go for ‘Shahi Tukda’. This nut and rabdi filled toasties will definitely satiate your sweet tooth. All the south Indian food lovers, gather around because this one is just for you. Panchratan Uttapam is a combination of 5 different flavored Uttapams served at once. 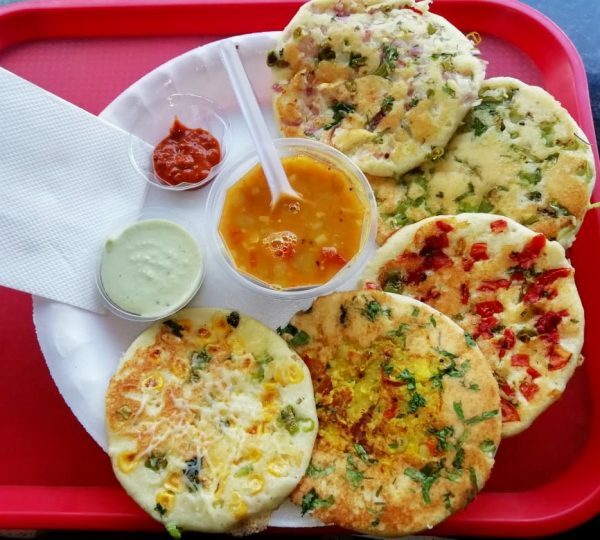 These 5 flavors include corn and cheese, onion uttapam, mix veg uttapam, onion tomato capsicum and a plain one. These are served with two types of chutney – coconut chutney and tomato chutney and a steaming hot bowl of sambhar to go with. 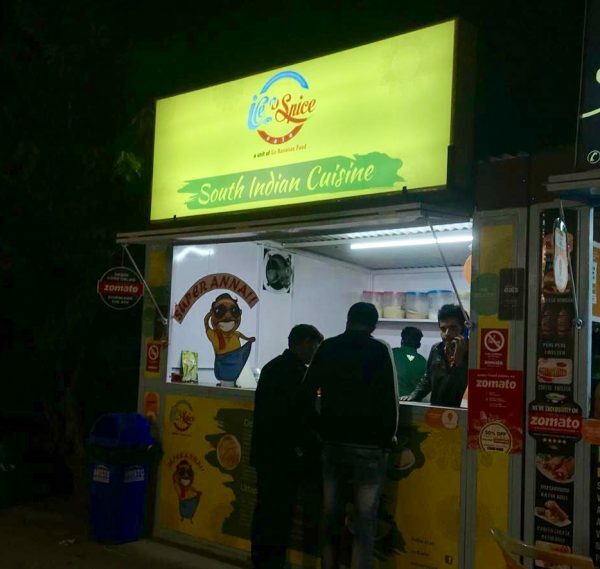 Also try – If you have any more space in your stomach, try the Rawa Masala dosa there and thank us later. 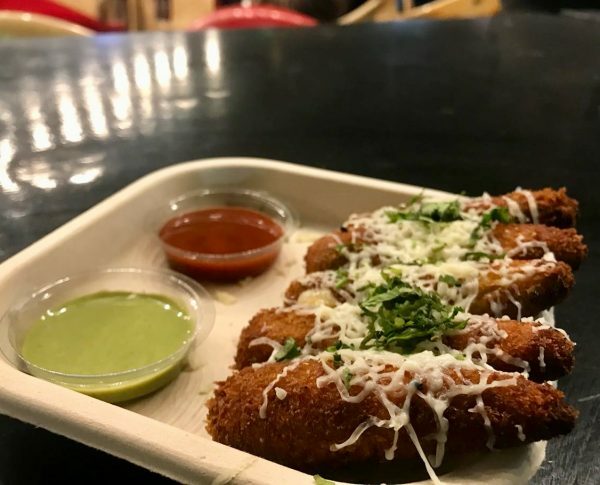 Don’t go on their simple looks, these inside-out cheese filled cigar rolls will give you a gastronomical experience that nothing else can give. These rolls are made from two simple ingredients gooey potato mix and liquid & shredded cheese. This irresistible snack is served with ketchup and green chutney. Wanna have a sneak peek to more dishes by Desi Firangi? Click here. Also try – Fruit cocktail ice cream after these rolls and you can call it a day! Why smoke cigarettes when you can smoke desserts? 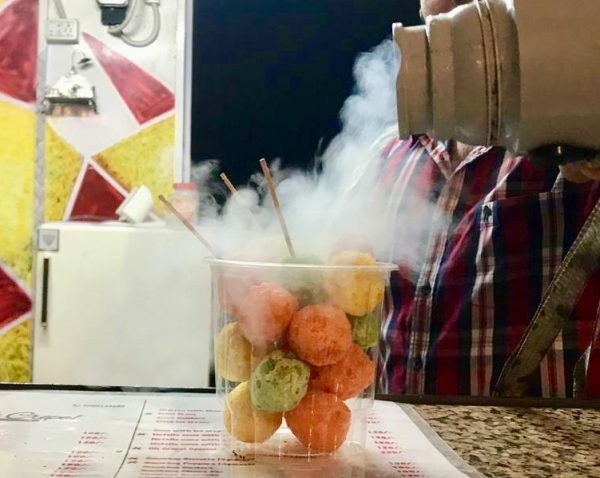 As soon as you put these icy cold poppers in your mouth, you’ll emit smoke like a dragon. This smoke is not harmful so you need not to worry about that. It is actually the liquid oxygen that is added to the poppers that cause the smoke. Do you think we missed something? Share it with us in the comment section below or write to me at juhee@udaipurblog.com.